It was The Milk Maid’s (your humble scribe) turn to dig out our weekly hit of inspiration today and it almost came crumbling down around my ears. Not one who enjoys leaving things to the last minute, I’d had it all organised; the quote was picked out well in advance and a suitable recipe pinpointed. Then the floor sanders answered our “we’re ready any time you are” email on Thursday with “how about tomorrow?” and it seemed churlish to say no. It did mean, however, that we would be without an oven for the weekend. Back to the drawing board for the refreshments. Luckily The Bin Inn has just added a cheese counter to their already amazing range of products; everyone was very impressed with the cheeseboard I put together. Crisis averted. I was much happier with the words I finally settled on. They’ll remind all on the Homesteader of the importance of keeping our music tuneful and true, especially as we launch into another school term and all the rules, conventions and “norms” we can’t quite adhere to..
May you all find joy in dancing to your own tune this week. 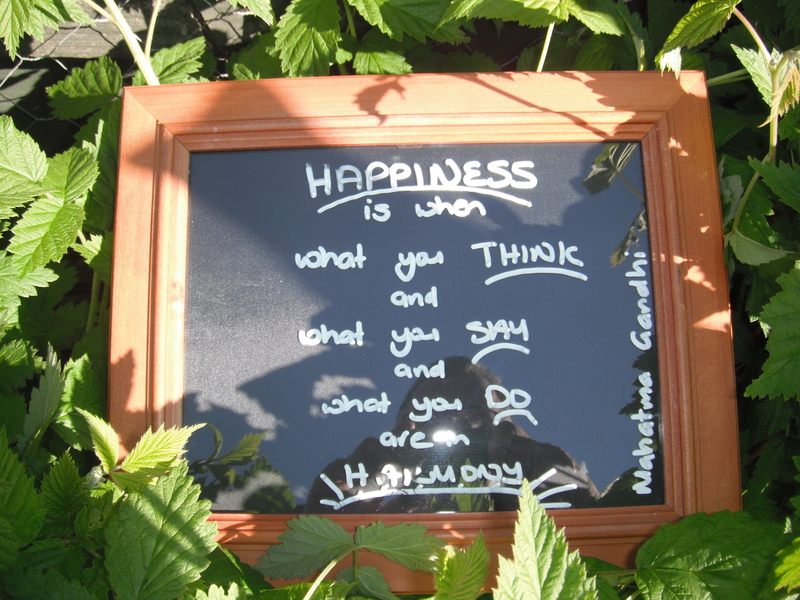 This entry was posted in Sage Words, Union Homestead and tagged actions, Gandhi, happiness, happy, harmony, Mahatma Gandhi, motivation, sage words, word, wording, words. Bookmark the permalink. You are an inspiration as always. Gandhi, simple and bang on, as usual. After I saw it, I thought back over our week, wondering how often I’d felt like those three elements had come together for me. Maybe not as often as I should, but there were many harmonious moments as well. Here’s to striving for more of those. Nettles? You’re feeling harmonious about nettles? I’ve been thinking along the same lines as you and have discovered the thing that snaffles me from enjoying more harmonious moments is the who “say” aspect. Not that I say stuff that isn’t true to me, but more I don’t speak up for my beliefs in the general ebb and flow of small talk and just let it pass. As a result, I have way more of them when living my little hermit existence or only interacting with people who are happy to take time over a conversation. As for the nettles, not so harmonious today as I have just finishing clearing another garden bed of the blimmin’ things and my hands are protesting slightly. Fabulous quote! I don’t like having to make sudden changes to plans. Congratulations for coping so well! What a pity to have wasted your ammunition. Can you reveal what the quote was secretly. But I admire your flexibility and a cheese board is always a good solution for practical anything. How did the floors come out? Oh, don’t for a moment believe that I am that quick thinking with anyone outside the Homestead 🙂 I, too, spend hours re-visiting situations in which I have been struck dumb, thinking of clever retorts and awesome rebuttals. and the floors are nearly finished now – just one more coat to go. They look just how we hoped they would.